Lindsay Noyes has been a professional freelance writer since 2005. She started out working for the Boston office of Phillip Morris as a freelance marketing associate and has been published in "Men's Health" magazine as well as some online magazines. Noyes holds a Bachelor of Arts in English from Western Kentucky University. French fries are a delicious and versatile side dish. They go great with everything and are easy to prepare. The only problem is that they are usually prepared using oil, which makes them high in fat and calories. 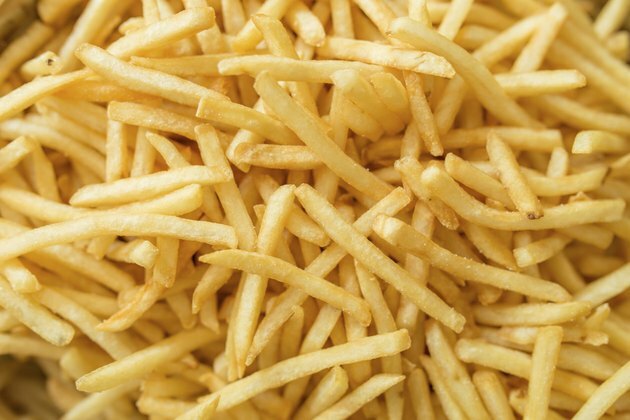 To enjoy french fries without the guilt, prepare them without oil and bake them in the oven. Wash the potatoes with water and peel off the skin with the vegetable peelers. You can leave the skin on if you want. Cut the potatoes into 1/4-inch slices. Preheat the oven to 400 degrees. Lightly spray the baking sheet with cooking spray. Spread the potato strips onto the baking sheet in a single layer. If skin is left on, place skin side down. Spray the potatoes with cooking spray and sprinkle with salt and pepper. Bake for 25 minutes, flipping over after 15 minutes. Potatoes will be a golden brown color. Sprinkle with more salt and serve with your favorite entree. Grated parmesan cheese, paprika, thyme, rosemary and red pepper flakes can be added to the fries immediately after baking for additional flavor. Using frozen french fries will reduce the time and effort. This can be done by omitting Step 1.